All lessons are scheduled by the school director and the string program teacher. Lessons are scheduled individually and the students meet with their teacher on weekly basis. Lesson length is determined at beginning of the academic school year and is currently set at 30 minutes on Wednesdays and Fridays. Group classes are scheduled around the performance date and include: group playing, ear training and music theory, and group performance. To expand students’ knowledge of chamber music literature group playing opportunities range from duets, trios and quartets. Each group class will provide an opportunity for students to perform a prepared solo piece (if applicable) and get input from the teacher on their progress. Fall and spring recitals offer the opportunity for students to demonstrate their progress to family and friends and help develop self-confidence and musical mastery. All Students are required to participate in each concert. Each student will be encouraged to perform a solo after at least two years of attendance of the program to the teacher’s discretion. Each student will receive his/her solo performance assignment at the beginning of each semester. The teacher will decide if the student is ready to perform a solo recital. Students present group performances in the annual recitals. Group selection is based on the level of mastery and progress of each student. This class is designed for students who have never played a string instrument before. 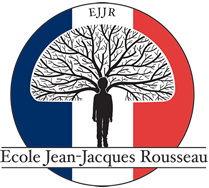 This level includes usually children age 5-6 years old or for students who are new to Jean-Jacques Rousseau and have transferred from other programs. Older students starting Violin at Jean-Jacques Rousseau may move quicker to the next Music levels depending on their progress. This class is designed for students who have completed Suzuki Book 1 and can read music. This class is designed for students who have completed Suzuki Book II, and are in a the process of learning how to shift and vibrate. This class is designed for students who have completed Suzuki Book III, can shift and play comfortably in I,III position, and are learning II and IV position: can vibrate. Chamber Music I is a class for students who are studying in Suzuki book IV and beyond. This class is designed to further the skill of ensemble playing. Students will learn works such as Corelli, Vivaldi and Bach concerti grossi. This class also includes solo performance and advanced music theory and ear training. The String Conservatory Level is for serious students and families who want to make music a priority. The participating students will be enrolled in two lessons per week (45 min or 1 hour depending on the age of the child), and one master/theory class per month. Each student enrolled in this program will be able to attend an additional technical class with his/her parent free of charge. Students will perform in two solo performances, and two ensemble performances at the conclusion of the fall and spring academic semester. Students will be encouraged to participate in contests and competitions. A minimum of an hour practicing will be required four times a week. This program is not for beginning players. Students who have completed one year or more of playing their instrument will be considered. Students will be chosen to participate by the school director and/or the teacher’s recommendation or by an audition. In order for students to be successful, it is necessary for practice to be a regular part of their schedule each week. The following is a guideline for achieving successful results for the student and the parent. Practice is to occur at a minimum of three days per week, however five to six days per week is recommended for greater success and progress. Twinklers: Preferably two short sessions per day lasting 10-15 minutes each. Book 1: A minimum of 30 minutes per day. Books 2 and 3: A minimum of 45 minutes per day. Books 4 and 5: A minimum of 60 minutes per day. Books 6 and 7: A minimum of 90 minutes per day. Books 8 and above: A minimum of 2 hours per day. Each student will need a properly sized, good quality student violin, bow and case. Please do not purchase a violin off of the internet. We recommend renting a violin from a local shop (see recommended list below). The shop will size your child accurately and will provide a quality violin. We also recommend adding the monthly insurance they offer just in case something happens to the violin or bow. Students will also need a shoulder rest (Kun or Fom are recommended brands), rosin, Suzuki Violin Book and the corresponding CD. The instrument must be maintained in good repair at all times. Student must bring his/her binder and all music books to every lesson. Listening to the Suzuki CD must take place every day. It is important for the student to spend some of the listening time focused only on the current song he/she is working on. The rest of the listening time can be more relaxed with the CD on in the background while you are in the car, eating dinner or doing homework. It is also very beneficial for students to listen to other classical, folk, fiddle or bluegrass recordings they might have in their music library. Students must practice every day, as successful, satisfying music study depends on consistent, daily practice. Practice length will depend on the length and the difficulty of pieces assigned each week. To help them with their daily practice students under age twelve must have a parent or a guardian attend their lessons, at least once a semester, and practice daily together. We encourage a dialogue between teachers and parents about issues that may help the student learn. Student must attend the annual performance as a requirement of the program. Students may be subject of an academic disciplinary action for a missed performance without a proper medical note from their doctor. We believe that creating a musical culture for each student is just as important for musical development as practicing. Seeing professional players on stage, or college students, encourages out young students to play and practice and inspires them greatly. We require each student to attend one string concert per semester. Please note that Butler School of Music offers free concerts for the public. Students who do not attend any concerts may be subject of a disciplinary action. The following form must be filled out and given to the instructor at the end of the school year. Attendance to the violin sessions is mandatory and all sessions are scheduled during school hours. When a student misses a school day for sickness, the lesson can be made up with a note from the pediatrician. One private lesson per semester will be made up depending on the student weekly school class schedule and the teacher’s availability. There are no make-up session offered for forgotten instrument or a non-medical school absence. The school encourages their students to complete summer private lessons with their teacher, and during the month of July or August. The teacher will inform the school by fall of the students’ progress, and of those who have taken summer classes for appropriate level assignment comes fall. Students who have taken summer private sessions are most likely to have progressed and will be assigned different level comes fall semester.